Soybean oil, water, sugar, vinegar (rice wine, distilled, cider), tomato paste, salt, mustard flour, onion powder, xanthan gum, paprika, propylene glycol alginate, paprika extract, calcium disodium edta (used to protect quality), natural flavors. This gluten-free salad dressing is versatile, with alternative applications ranging from marinades and dips, to glazes and finishing sauces. As part of Unilever, we understand consumers, your guests. We use this knowledge to help chefs and caterers keep up with people’s changing tastes. 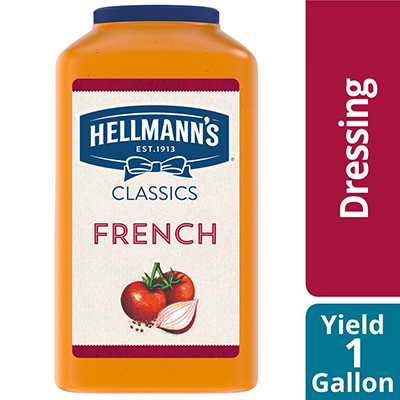 Hellmann's Classics French Salad Dressing offers premium quality with shelf-stable convenience.